Victoria, Mahe (Seychelles) – October 23, 2018 (travelindex.com) – Didier Robert, the Regional President of Reunion Island has arrived in Seychelles for the coming Festival Kreol of the islands. President Didier Robert is in Seychelles with an important delegation and will be having s series of meetings with Government Leaders and Officials as well as the French Ambassador accredited to Seychelles. He will also mark this years Festival with the opening of the “Antenne Reunion” Office. I had the pleasure of again sitting with President Didier Robert after his arrival in Seychelles and together we reviewed the spirit of cooperation in the Indian Ocean Vanilla islands, a point we have both believed in in the years we worked closely together in the Vanilla islands. Government Vertical policy only targeting the tourism industry players. The cost for a country’s tourism industry is determined on the ability to produce more locally and for Seychelles to push with vigour the “Made in Seychelles” label. It is also dependant on the Government’s ability to understand that a hotel in Seychelles are not competing amongst themselves by that instead the Seychelles needs to be seen as an appealing holiday destination when apples are compared to apples and pears to pears. Seychelles cannot be seen as the destination bleeding its tourism industry through taxes, fees and utility charges. Just weeks ago Seychelles saw the election of Miss Regatta and now last weekend Seychelles elected Ketsia Marie as its Miss Creole International 2018. The 1st princess is Tisha Loze and as 2nd Princess Nathasha Chetty. Both these beauty with a purpose pageants were private sector driven and with success. The Regatta is a Round Table event and Miss Creole International is the work of Telly Modelling Agency of Terry Carolla. Seychelles needs to congratulate both these organisers for proudly putting forward the talents of the islands and in so doing opening doors for them. Albert Durand’s post on Social Media last week publicised that Seychelles was proud to be having a new record for Yellow Fin Tuna. The previous Seychelles ‘Rod & Reel’ Record stood at 96.1kg. The new Seychelles ‘Rod & Reel’ Record is now 100.6kg caught by Captain Sony Parekh and Angler Mohamed, a tourist from Oman who flew in to go fishing with Sony. This catch helps to position Seychelles as a destination for Big Game Fishing and comes as Sail Fish Season is kicking in. Denis Island has been recording excellent catches of Sail Fish as they continue to pursue their policy of ‘tag & release’. South African Lavone Wittmann has been elected the new president of Skal. The elections took place during the 79th International Skal Congress that was help in Mombasa in Kenya. Minister Najib Balala, the Kenyan Minister responsible for Tourism had said earlier that Kenya had been gearing up for the biggest gathering of professionals within the hospitality and travel industry from all over the world. 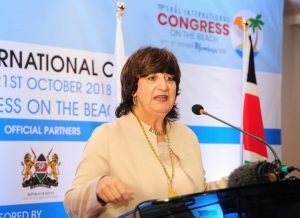 It was Kenya’s second city, Mombasa that was the host city for the 79th International Skal Congress.